Higher education is coming under increasing scrutiny, both publically and within academia, with respect to its ability to appropriately prepare students for the careers that will make them competitive in the 21st-century workplace. At the same time, there is a growing awareness that many global issues will require creative and critical thinking deeply rooted in the technical STEM (science, technology, engineering, and mathematics) disciplines. However, the existing and ingrained structures of higher education, particularly in the STEM fields, are not set up to provide students with extensive skill development in communication, teamwork, and divergent thinking, which is needed for success in the knowledge economy. 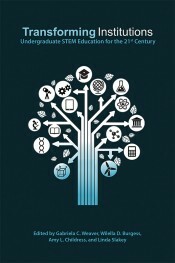 In 2011 and again in 2014, an international conference was convened to bring together university leaders, educational policymakers and researchers, and funding agency representatives to discuss the issue of institutional transformation in higher education, particularly in the STEM disciplines. Central to the issue of institutional transformation is the ability to provide new forms of instruction so that students can gain the variety of skills and depth of knowledge they will need. However, radically altering approaches to instruction sets in motion a domino effect that touches on learning space design, instructional technology, faculty training and reward structures, course scheduling, and funding models. In order for one piece to move, there must be coordinated movement in the others, all of which are part of an entrenched and interconnected system. Transforming Institutions brings together chapters from the scholars and leaders who were part of the 2011 and 2014 conferences. It provides an overview of the context and challenges in STEM higher education, contributed chapters describing programs and research in this area, and a reflection and summary of the lessons from the many authors’ viewpoints, leading to suggested next steps in the path toward transformation. I believe that we have now entered what many undergraduate STEM education reformers consider an historic era. For decades efforts to improve undergraduate STEM met with varied forms of resistance. Many faculty and administrators rightly demanded to see the evidence that new, active approaches to pedagogy were more effective than traditional lectures in helping a broader array of students (including those who thrived on lectures) learn. That evidence has accumulated and is unambiguous. Thus, much of the resistance has abated, but not completely. Variables as diverse as departmental and institutional infrastructures, funding priorities by institutions, expectations of college students who are the generation of testing of low order skills and knowledge under No Child Left Behind, and current emphases in graduate education all still serve as barriers to more widespread dissemination and adoption of demonstrably effective teaching methods. In short, it’s a systems problem. Gabriela C. Weaver serves as vice provost for faculty development, director of the Center for Teaching and Faculty Development, and professor of chemistry at the University of Massachusetts Amherst. Wilella D. Burgess serves as managing director for Purdue University’s Discovery Learning Research Center, an interdisciplinary center that examines the science of learning and seeks more effective ways to transfer cutting-edge research to learners. Amy L. Childress serves as director of the Office of Undergraduate Research at Purdue University. Linda Slakey served at the University of Massachusetts Amherst from 1973–2006 in various capacities. From 2006 through 2011, she was director of the Division of Undergraduate Education at the National Science Foundation. At present, she has a consulting practice in Washington, DC.